don't miss out on all the latest! Grab this “Big Heart” gift tag printable for your child’s favorite teacher and use it to decorate a large jar filled with their favorite candy! Teacher Appreciation is fast approaching, and chances are your children are going to want to send in a gift for their teacher. Perhaps bath bombs, bath salts, or even a gift card to Starbucks or candy. Who doesn’t love candy? I think we can all agree that Skittles and M’n’M’s are pretty amazing to receive! Skip into Hobby Lobby and pick up a few cute treat jars, and let your kids pick out a fun candy to give to their teacher(s) – chances are, they’ll jump at the opportunity to print out these cute gift tags, fill up a candy jar, and tie the jar with a cute ribbon along with a gift tag for their beloved teacher. After all, what would we do without our teachers? They take such great care of kids all day long. These gift tags are cute for any teacher – young or old. Simply pick up a pack of cardstock at your local Staples, or order a reputable variety from Amazon. Gather together some ribbon, scissors, and a hole punch. These cute gifts are not only easy to put together, your kids can help too. 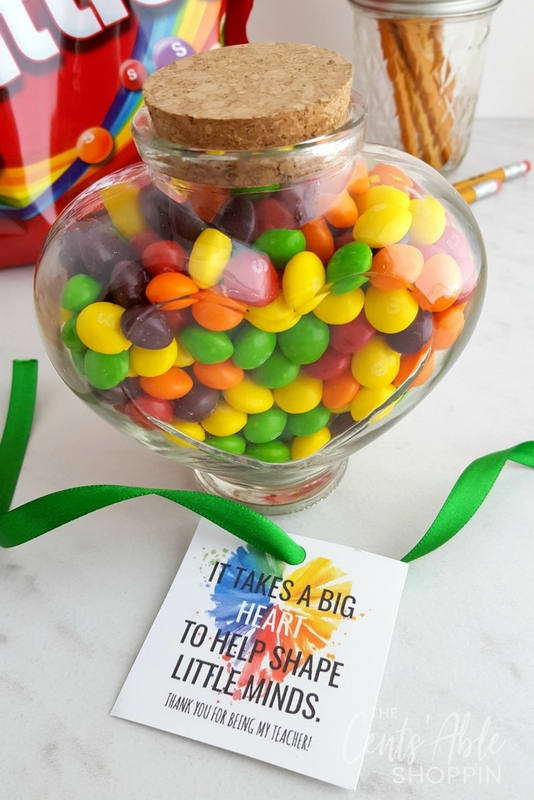 I hope you have just as much fun putting these together as I had whipping up these tags for you ~ a colorful tag + cute heart jar with cork lid + colorful candy = paradise! Use scissors to cut along the dotted lines on each printable tag. Use the hole punch to create a hole in the top left corner of the tag. Run a ribbon through the hole and wrap around jar of colorful candies or any special gift for a teacher. Join me in a quest to be more intentional ~ eat better, live better and save more, so you can give more. Visit The Cents'Able Shoppin's profile on Pinterest. Copyright ©2019, The CentsAble Shoppin. All Rights Reserved.